It doesn’t feel long ago I was emailing to notify you of the first round of the season, yet here we are facing the concluding round of 2014!! Sunday 30th November, Sign on from 9am until 9:30 sharp, Fortstreet Carpark Sandown. As with last year we have access to the car park across the road, (to the rear of ye old Bogeys) therefore can all non competing cars, tow cars and trailers park there, this is to maximize the competition space for us to compete on! Please note at no point should a non road legal car be used to drive between Fort street public car park and the stone car park behind bogeys. If you are trailering a non road legal car then please allow enough time to unload in the main car park before moving your tow car and trailer to the car park the otherside of the road. Like wise at the end of the event please load back up in Fortstreet carpark. Can drivers also please ensure noise is kept to an absolute minimum prior to 10am. Finally, if you haven’t seen it already Kev Richardson and Adam Wellar have put together some excellent event reports on Youtube, please see the IOWCC youtube channel to check it out! Richardson Wins and takes the Turbine Trophy! Kevin Richardson proved to be the quickest man of the weekend during the Isle of Wight Car Club’s 51st double header ‘Healey’ weekend in his Mini, posting the fastest overall times at both BAE Systems and the Isle of Wight College, despite competition from a vast field of drivers including members of the Austin Healey club. Dan Morgan came second at BAE on Saturday in his Caterham, though he was almost 1.5 seconds down on Richardson. Toby Allen was third quickest at BAE with his newly purchased Subaru, with Andy and Adam Greenen coming fourth and fifth respectively in their shared Mini. David Goodwin rounded out the top six in his road legal competition-spec Mini. The following day, Richardson came under extreme pressure from Adam Greenen, with just one-hundredth of a second separating their fastest times of the day in what proved to be one of the closest rounds of the season; Toby Allen and Dan Morgan also came within a second of Richardson on the college layout, which had been slightly curtailed due to construction work. 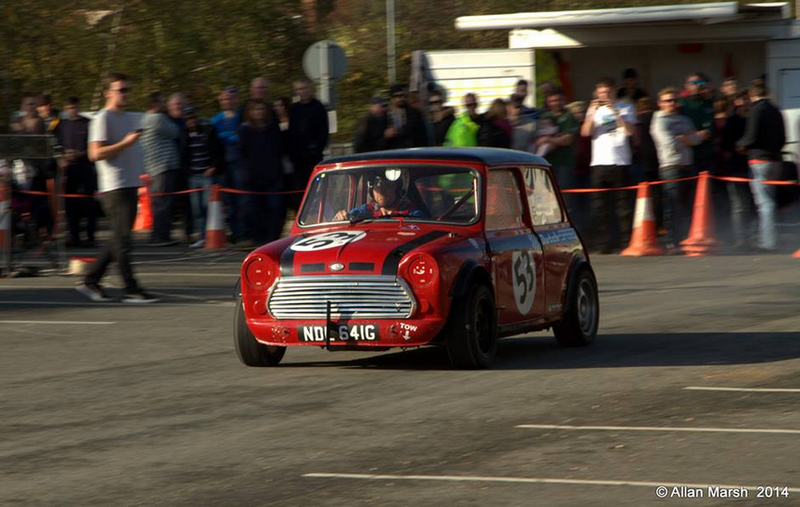 David Goodwin found himself using his unmodified Mini at College, following a driveshaft issue en route to the event for his usual competition car. He finished the day 24th. The two rounds were not only counting towards the championship, but also towards the special ‘Turbine Trophy’ award, awarded to the fastest driver of the weekend. This year, it was Kevin Richardson who not only took the Turbine Trophy, but also an award for being the quickest Class Three driver of the weekend. Toby Allen took home the award for Class Four, while Dan Morgan took home the prize in Class Five. Darren Cole took home Class One honours in his unique Honda Logo, while Dean Long took home two awards for his performance behind the wheel of his MKII Mazda MX5, one for being the quickest Class Two driver, and another from the Austin Healey club due to his spectacular drifting style. Vicky Cox was the quickest lady of the weekend in her Peugeot 205, continuing a good run of form from the previous two rounds. After the weekend was over, Kevin Richardson was keen to thank Dutch Speed, who prepared his engine for this year, which has led to a very competitive 2014 sealed surface season for the Mini driver, culminating in his performances this weekend. With just one round left to run, the sealed surface championship is still very much up for grabs, with Dan Morgan and Kevin Richardson heading to the event at Fort Street, Sandown tied at the top of the points table.